I am inspired to write this blog post after reading this article on the Yoga Journal web site. Like the author of the article, I’ve been practicing yoga for over a decade. Each teacher you come across has their own, unique teaching style. Some have been better for me than others. Years ago I used to attend a class where the teacher would sweep in about 30 seconds before the class was due to start. If the teacher was in a bad mood, the whole dynamic of the class was skewed. The teacher also used to exude a holier-than-thou-I’m-the-guru attitude. It was actually a bit scary. I was definitely hooked on the yoga, not the teacher. I’ve met other teachers like this too. They are inaccessible; preaching from a pedestal at the front of the class. You can’t ask them anything because there is an unspoken rule that they are not to be approached. Sometimes I’ve felt like I’ve been looked down on by a teacher because I am not as ‘enlightened’ as they are. Then there are the classes where you are not allowed to speak. You go in, do your asanas and leave again. There is no interaction between you and anyone else in the class. Don’t get me wrong, I don’t think classes should be a huge social event, but silent solemnity can be extremely off-putting for people. 1. Stay present. You can’t teach a class if your mind is elsewhere. 2. Laugh. It is very difficult to hold a balancing pose whilst trying to instruct a class. I have fallen out of tree pose a number of times, especially when explaining that you can’t balance properly unless your mind is clear! 3. Be normal and approachable. Students need to be able to relate to you. They can’t relate to you if you are removed from the reality of daily life. They don’t want an ethereal-kaftan-wearing-patchouli-smelling-someone-who-thinks-they-are-a-goddess. Make your students welcome. Give them that warm, fuzzy feeling. They are loved and cared for and you are happy they come to your class. 4. Teach what your pupils need to learn. Don’t start demonstrating your yoga prowess by jumping into Bird of Paradise in a beginners class. The class is about the students and their needs. It’s not about you. 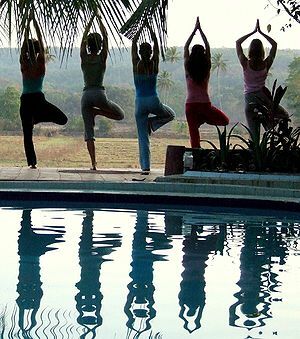 Similarly, most yoga students attend class for the physical exercise. Don’t get straight in there and start talking about Patanjali’s Yoga Sutras until you have a good understanding of your students and how receptive (or not) they might be to learning about the more spiritual and philosophical aspects of yoga. 5. Leave your own crap outside. Don’t walk into a class and announce to everyone what a rubbish day you are having. The students are paying you to teach them. They are not paying to listen to your problems. If it’s a small class, take five minutes at the beginning and end of the class to let the students talk about their day, if that’s what they want to do… of course, not everyone wants to share and that’s ok. Some people seem to be able to concentrate better if they can shed some of their baggage before the class begins in earnest. 6. Be prepared to adapt. It is allowed to move away from your meticulously-planned class structure if you feel you need to, or if it becomes apparent the class you’ve planned is too easy or hard… use your instincts, use your eyes and ears. You have to be able to improvise and modify depending on the needs of your students or even the dynamic of the class that day. Last year I went to a small, local class for about six weeks whilst I was between jobs. The teacher is absolutely lovely. Very attentive, very creative, very caring. A real, genuine person who uses her life experience to try to understand and make a connection with her pupils. I’m just starting out on my journey, but I want to make sure that I am becoming the very best teacher I can be without losing any of myself along the way! Categories: Uncategorized | Tags: Patanjali Yoga Sutras, Yoga, Yoga Class, Yoga Journal | Permalink.